On your practice area, lay out the bungee cord in the same way that you would lay out boundary strings for a marked terrain, stringing it between nails driven into the ground. Pull the bungee cord tight enough to keep it straight, but don’t stretch it. Buy a wiffle ball (baseball size, not softball size). Mine cost $2.50. Use some string to tie the wiffle ball to the middle of the bungee cord. That’s it. You’re ready to start your shooting practice. You can see in the picture at the top of this post that the wiffle baseball is almost exactly the same size as a petanque boule. Here’s a short Youtube video that shows how the wiffle ball acts when hit. 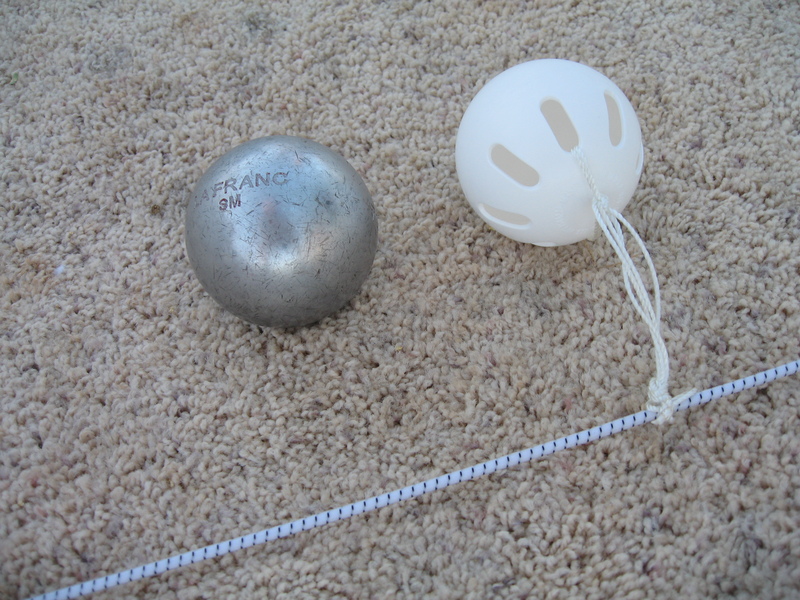 You can do the same thing with a real boule, but it is more difficult to do, and I personnally think it is quite clumsy compared to a wiffle ball. This entry was posted in Equipment for training/practice, My shooting pit by Jules Lenoir. Bookmark the permalink.